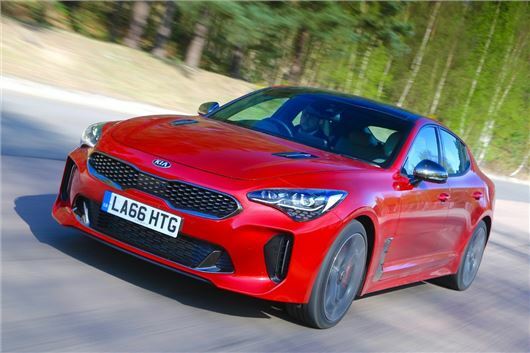 The Stinger, Kia's first gran turismo and first rear-wheel-drive car in the UK, will arrive in showrooms from January 2018. Priced from £31,995, the Stinger will come in three trims; GT-Line, GT-Line S and GT-S. The GT-Line and GT-Line S both offer the choice of a 244PS 2.0-litre petrol engine or a 197PS 2.2-litre diesel. All models are rear-wheel drive and come with an eight-speed automatic gearbox, with the option of manual control using steering wheel-mounted paddles. The top of the range GT-S is powered by a twin-turbo 365PS 3.3-litre V6 petrol engine and is priced from £40,495. All models have an 8.0-inch touchscreen Navigation system, which offers traffic information, weather updates and speed camera warning. It can also be connected to Android Auto and Apple CarPlay via a smartphone. It gets a reversing camera, as well as front and rear parking sensors. A head-up display is also a standard feature, which displays speed and navigation instruction. Standard safety features include Autonomous Emergency Braking, Lane Assist and Speed Limit information. GT-Line S and GT-S also have Blind Spot Detection. There are projection headlights on GT-Line, and full LED headlights on the other two trim grades. All versions have daytime running lights. Leather upholstery is available on all trims in black, grey and red, along heated front seats on all trims and heated rear seats on the GT-Line S and GT-S. A powered tailgate is also fitted to GT-Line S and GT-S.